Inder Loves Folk Art: Tiramisu Dress, coming right up! A few months ago, I was thinking about making myself something for a change, so I started searching for a pattern for the perfect nursing dress. If you've nursed a baby (or a few), you know the dress - comfortable, forgiving to a post-baby figure, with easy access for the baby. Well, I didn't have much luck in my search, until I stumbled on a link to the "Tiramisu Dress" pattern from Cake on Mikhaela's blog, Polka Dot Overload. Mikhaela and her husband are doing all of the the pattern illustrations for this new pattern company. Let's talk about how perfect this pattern is for a second, shall we? Soft knit dress, surplice neckline allowing for easy access for nursing, just enough waist definition to be flattering post baby, and a swishy a-line skirt. Also, WOW, does that say it goes up to a D-cup? (Never mind I'm a DD while nursing - this represents a pretty massive improvement over the average B-cup pattern for me.) And the size range goes from a 30"to a 50" bust. Now that is what I call a good size range - I love a pattern maker who tries to be inclusive of all different body shapes and sizes. Add the illustrations, which show a curvy woman of color (yay Mikheala! ), and I'm super sold. 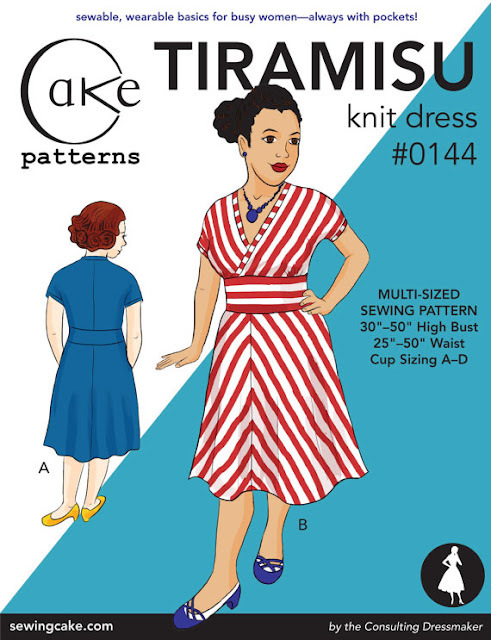 So I preordered the pattern, but alas, did not have my act together to participate in the awesome Tiramisu Sew-Along that happened shortly after I received it. Among other difficulties, I had not located the perfect fabric for the dress. In truth, I didn't actually go to the fabric store and look - I was just too busy. But I did follow along and ogle everyone else's Tiramisus, of course. The great thing about sewing a dress after the sew-along is that you have all of the information at your disposal right from the get-go, right? That's my story, and I'm sticking to it. Last weekend, I took a little trip to the fabric store, ostensibly to pick up some fabric for a quilt square (I'm in a quilt circle, and I am chronically months behind schedule) and get some thread for my fancy new serger, which I have barely had time to experiment with since I got it last month. Of course, I had to take a peek at the knits. I didn't have high expectations, because (a) it's really hard to find nice weighty, non-transparent knits that would be appropriate for a dress; and (b) I'm very, very picky about what patterns and colors I will wear. If I'm going to go to the trouble to make myself something to wear (and it is a lot more trouble to sew for my picky self than it is to sew for the kiddos), I want to really love the fabric I'm working with. 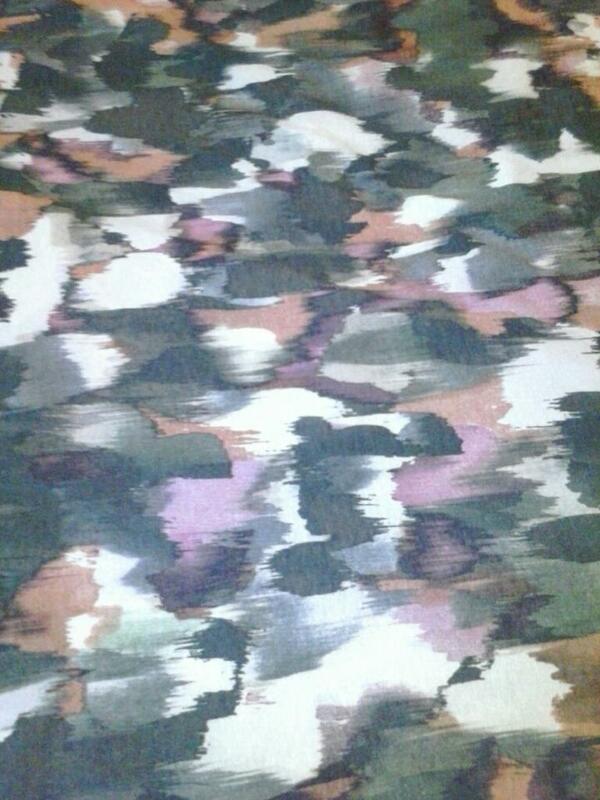 I spent almost as much on cream and brown serger thread to complement this fabric as I did on the fabric. So now I have to actually sit down and make the dress! Will I use my serger to construct it? Good question! I still a newb at serging, so we'll see how it goes. My goal is to do as much of this dress as possible on my new serger, but if that plan totally goes to hell, I do have my trusty sewing machine with walking foot to fall back on. Of course, there's the minor matter of finding any time, between kid-wrangling (with a suddenly mobile baby!) and cleaning and my usual weekend activities, to work on it. While I would love to sit down and bust this dress out in a day, it would probably be more realistic to think of this as a project that may take a couple weeks of plugging away for a short time each day (kind of like the sew-along, come to think of it). I'm hoping that blogging about it will motivate me to keep working on it, in order to entertain my readership with my sewing bloopers show off my new skills! New fabric, new pattern (for picky me! ), and new serger! It's a tall order, huh? That is a really cute pattern! When I first started sewing with knits I would sew them on the regular machine, then on the serger. Pft, what a waste of time! I was just scared;) Now I can manage everything besides the neckbands, I still regular machine then serge them. Good luck, can't wait to see your dress! "by the Consulting Dressmaker" might be a reference to Sherlock Holmes?